Ministry of Cultural Affairs MOCA published New job vacancy Notice at http://moca.teletalk.com.bd. MOCA Jobs Circular offer New vacancy in this post. Honours And Graduate Student also apply this MOCA govt circular 2019. MOCA Teletalk Job application process written below this post. You must have to complete your MOCA Teletalk Application before 28 February 2019. At First Go to http://moca.teletalk.com.bd to get to the MOCA application web page. Click Application Form and go ahead.Then Fill Up Your Application Form. Upload Your newly Photo and Signature[ Photo size upload JPEG/JPG format photo (300×300) pixel and photo size, not more than 100 KB & signature (300×80) pixel and photo size, not more than 60 KB] Re-check Review Your Information and Click Submit Button. After Complete Application Form Submission by Online, Print Your Application and keep Save. You Will Find your User ID in your Application Form for Send Pay fee by Teletalk Mobile SMS. Reply: Congrats applicants get his/her addressing full Name a personal ID number (PIN) informing amount of fee to pay for MOCA application program for recruitment. Reply: Confirms applicant of fee submission and allot a USER ID & PASSWORD unique to every applicant. After getting notification through SMS or Website by using individual’s unique USER ID & PASSWORD Applicants can download admit Card. N.B. Admit card download timetable and further exam timetable any MOCA related notification will be notified through SMS For further info, visit the MOCA website. If You want to apply BANGLADESH Ministry of Cultural Affairs MOCA govt job circular through online you have to visit there official Teletalk website . For Next Updates about MOCA Job circular Vacancy Notice,Exam Result or Admit card Download stay with us. This entry was posted in bd jobs today, Govt Jobs 2019 and tagged Govt. 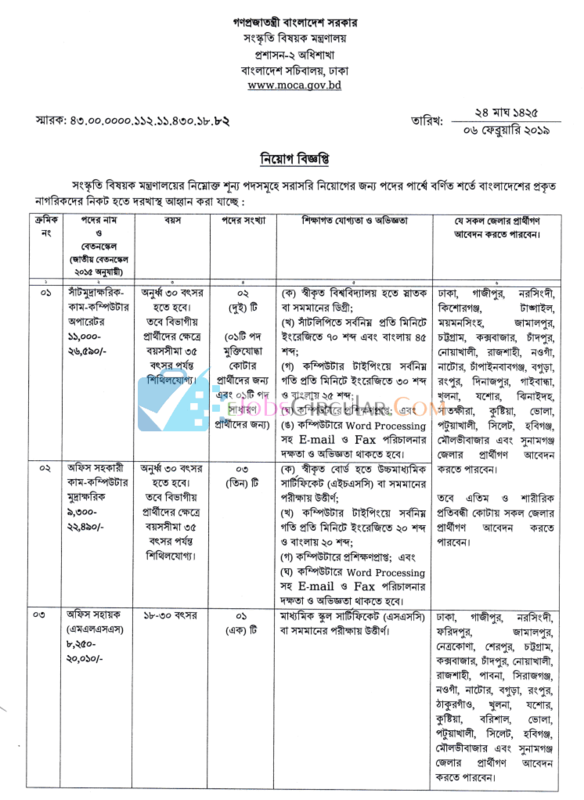 jobs, Ministry of Cultural Affairs job circular, MOCA Jobs Circular 2019, MOCA Teletalk ONLINE APPLICATION FORM - https://moca.teletalk.com.bd, moca.teletalk.com.bd, www.dpl.gov.bd Job Notice 2019, www.moca.gov.bd by Raju Ahmed. Bookmark the permalink.